Looking for worksheet practice that doesn't feel like a worksheet? 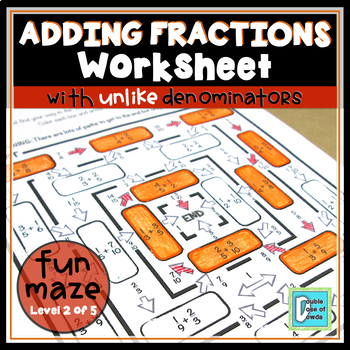 This activity allows students to practice adding fractions with unlike denominators. This particular maze will require students to correctly complete 9 different problems to make it through the maze, although all 20 problems included in the maze have a correct answer listed. 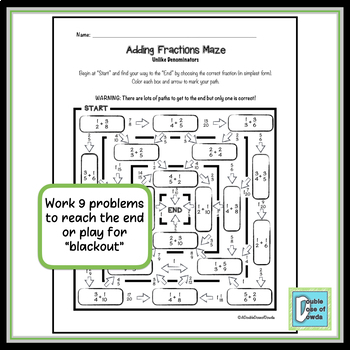 This is the second level of our Adding Fractions Maze Bundle. ♥ "I am so excited to use this! I used the mixed number maze last year and my students loved it! Thanks!" ♥ "This was quite engaging for my 6th graders! We were starting to get into a rut so I thought this would be something different! The students are enjoying this! I teach 6th grade special education math!" ♥ "I used this in centers and my students loved the activity!" ♥ "Fun activity. We used it to review the concept as an independent center and it went great!"